SRB is hosting a challenge this winter focusing on CLUTTER. Oh my, do me and clutter have a history. This challenge actually comes at the perfect time since 1. we just moved and have already gotten rid of a huge percentage of our belongings and 2. it’s January, and I’m super motivated to take charge of several areas of my life. Stuff suffocates me. I definitely have a physical reaction to clutter; my blood pressure rises and I sometimes feel like I am having an anxiety attack when confronted with it. However, I don’t think I’ve had the skills or true motivation until now to truly simplify and consistently deal with it. But I really want to change that. I have a medically fragile 3 year old who requires round the clock care and an almost 1 year old on the verge of toddlerhood who requires um, a lot of time and attention. I’m working on my marriage, my friendships, and the health of my family. These are my priorities. I simply do not have time for a ton of extra stuff that for the most part just drags me down. I’m sentimental. I have a hard time letting go of personal items, like pictures, cards, journals, etc. Thankfully, most of these things are now digital, stored neatly on this laptop. I love my kids’ teeny tiny baby clothes, but I’ve found I get so much joy from passing them down and seeing new babies wearing them- much more than when they just sit in a closet, taking up space. I’ve relentlessly parted with toys, most of them toys that Grayson never played with. Some of them Charlotte is now playing with, but especially since we have downsized in square footage, I just don’t want a lot of extra toys just laying around. Charlotte much prefers to play with medical supplies and iphones anyway! I believe I’ve done a really good job at cutting out the unnecessary stuff that we just don’t need, but now I need help managing the stuff that’s hanging around. For the challenge, we are supposed to post pictures of the areas that need attention- as is, no straightening. I’m posting a picture of our “pantry”- we no longer have a walk in pantry, which I think may be a blessing in disguise. 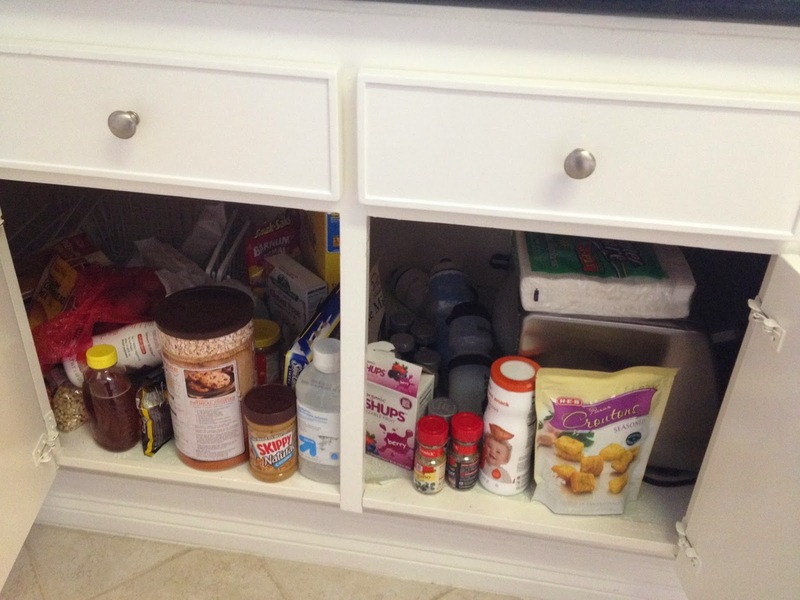 With a huge amount of space to store food (and in our case, totally random items we seldom if ever used) our pantry in our last house was a nightmare. I really want to keep the cabinet we are keeping food in organized, neat, and cost effective. SRB challenged us to really look at the photo(s) we post and think about the EMOTIONS they bring out. This pictures accurately depicts how I feel about my ability to feed my family: CHAOS! I don’t know if any of it has to do with Grayson and his journey to being exclusively tube fed, or just my feelings of inadequacy when it comes to shopping for and cooking good meals. In any case, the clutter in this cabinet is telling. What a great challenge! My pantry makeover that I did this summer brings me great joy every day when I am in it. I love the clear plastic containers and thus less half eaten boxes of stuff hanging about…much tidier. AND I am working hard to not overbuy and not get it overfull…some weeks I do better then others. Good luck on your reorg! You have inspired me. I dislike clutter, but have found myself surrounded. Time to gut it out and donate. A great way to start the new year. Thanks for the post and for the inspiration!